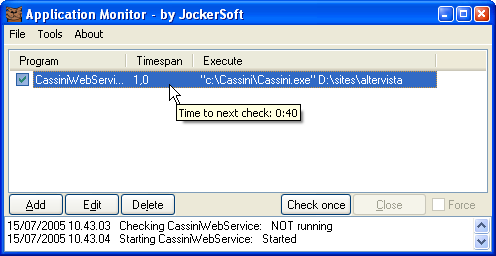 With Application Monitor you will always be sure that your important processes are running. AppMonitor has been developed keeping in mind all those admin and power users who use programs that must always been running (such as webserver, database, mailserver, p2p) and that don't have a built-in restart function. If you have an idea about a new feature to insert into this program or a suggestion, please send me an email : I'll try to implement it in the next version. Any comment/suggestion will be highly appreciated.